"We don't want no war tonight..."
Sorry for the delay. Somebody bombed London on Thursday. I've never walked so much in this city in one day, probably four hours worth. I've never walked through a bomb zone before either. Twice. It was touching to see how everyone in this city could get on with things in the face of adversity and how quickly everyone reached out to their friends and family. As a trivial aside, the bombings also ment that when my broadband also went down, there were no engineers to fix it. The city's getting back to "normal" now, broadband service is resumed and dubstep must go on. 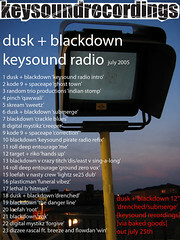 Watch this space in the next few weeks for the first Dusk + Blackdown Keysound Radio mix. Many months in the planning, many exclusives in the mix. someone should bottle this feeling, they'd make a fortune.